The Boys in the Boat consumed me while I consumed it. I blew dry my thick mop on the low setting so I could read more of it each morning. For a two week stretch I managed to work the book into every casual conversation. 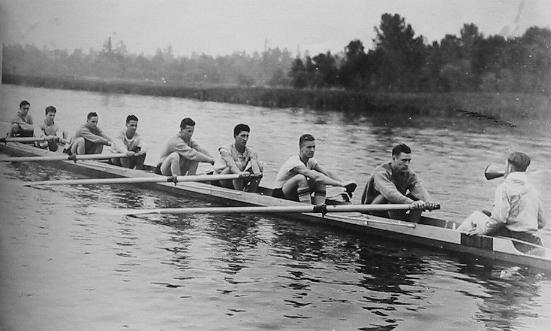 In short, the book is about rowing, about the University of Washington crew who took the gold at the 1936 OIympics. Daniel James Brown tells the story with skill, weaving the personal and team history of the crew, the craft of boat building, the Nazi propaganda guru, Leni Riefenstahl, together in so spell-binding a way that, even though you know the outcome of the final race, you have to turn the page to find out. Certain elements of the story were bound to draw me in: Nazi Germany, a motherless child, boating, work ethic, craftsmanship, athleticism. But what captured me the most was the harmony, the heartfelt cooperation, required between the boys in the boat. If you don’t like some fellow in the boat, Joe, you have to learn to like him. The combination of humility and confidence, requisite to a good crew, fascinated me. My husband has built and rowed several duck hunting scull boats in his time. By default (and by interest—his nightly question is ‘what are you reading?’) Curt gets the first feedback from my reading. But there was no way I could simply tell him about the chapter on the art of boat building. I read it aloud and reveled in his comments and appreciation. Reading in the age of YouTube means that the scenes recreated on page are available to watch on a screen. This short book trailer shows the stunning end of the Olympic finals. (I’m glad that I saw this after I read the book; knowing the back story helped me appreciate the significance that is hard to grasp in the few seconds of the footage.) What a thrill! As I read I bumped into “old friends”: The Suzzallo Library, Grand Coulee Dam, Fritz Kreisler (how does a world-class violinist get into a book on crew? ), Louis Zamperini of Unbroken fame, and Hugh Laurie. Yeah, that Hugh Laurie! If you loved Unbroken, odds are you will like The Boys in the Boat. This entry was posted in Biography, book review, Books, Death, Drama and tagged bookreview, boysintheboat, craftsmanship, crew, danieljamesbrown, georgepocock, joerantz, nazi, northwest, olympics, quote, rowing, scull, swing, uw, zamperini by alivingpencil. Bookmark the permalink. You sold me. Maybe I’ll just let you pick my reading lists. I still have goosebumps from that trailer! I put this on my list when you first listed it on Goodreads. Sounds fascinating! I’ll be curious to hear your response, Janie. So here’s the blow dry deal: I blow it dry without a brush, just trying to get it dry. I can read 4-5 pages while I do that. Then I use a curling iron, and I can read 2-3 paragraphs per curl. It works for me! I also read while blow drying my hair and chuckled at you blowing on low setting to extend your reading time, but I must have both hands to use the straight iron/curling iron/hot rollers, whichever suit my fancy of the day. Thanks, now I want to read that book and I know my husband and father will, too! I’d love to hear what you think, jep! My book group read this one. It was such an inspiration, and I learned so much about rowing. I was also inspired by this book. I’m not a big one for voluntary pain, but I sure admire ones who push themselves like crew does. I always like to read about different “worlds” and different communities that are totally foreign to me. I read this one a few months ago, and it was so absorbing. Who knew that there was this whole subset of people who devote their waking hours to learning to row? Thanks, Sherry. I appreciated going back and re-reading your thoughts. I’m such a wimp, but I get my thrills vicariously through reading about others’ feats of endurance. There was a young man from our county in Indiana who won a gold medal in rowing in the 2004 Olympics. I remember reading about him and about the sport in the local newspaper. He was a college basketball player in Tennessee when he was discovered by the rowing coach because of his natural athletic build and ability. He had never rowed before and won a gold medal in just a few years! I’ll add this book to my list as well.